The Core Team just returned from an enjoyable long weekend in Potter County, Pennsylvania. Actually. even an extended weekend feels pretty short when bookended with 320-mile drives, especially when young, active children are involved. But the journey is worth it when the destination is the bucolic splendor Sara’s parents call home. Fall’s foliage pyrotechnics haven’t yet peaked in Potter County, but the season is much further along than it is here in NYC… the trees have turned out while the migrants have moved on. If I’m being perfectly honest, as I so often strive to be, the bird action was rather bleak this past weekend. Bears demolished Ann’s array of feeders, which means that the usual throngs of social seed-eaters has been reduced to confused clutches of American Goldfinch and Black-capped Chickadee wondering when dinner’s coming. These year-round residents will be fine though; Ann planted a field of sunflowers to tide them over until the vandals enter hibernation. House Sparrows, European Starlings, Rock Pigeons, Mourning Doves, and American Crows, adaptive avians every one, seem to be getting by just fine without the handouts. The gist of my report is that things just weren’t happening in the lower elevations of God’s Country. The only surprise, a pleasant one indeed, was a flyover Upland Sandpiper, a species I’ve never noticed out there. The action improved a bit as we ascended to Sara’s dad’s demesne. Will had all kinds of sparrows either settling in for winter or stocking up for an imminent exit. Usually, the conifers in the front yard shelter Chipping Sparrows in summer and American Tree Sparrows in winter but if I don’t miss my guess, we had a mixed flock hobnobbing with the chickadees and Blue Jays. 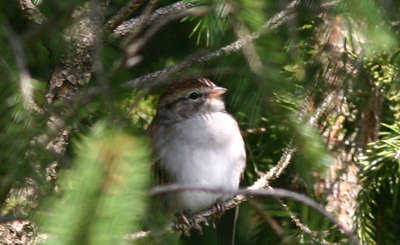 Another shocker was some Field Sparrows sharing shrubbery with a single White-crowned Sparrow, not to mention a House Wren. The white-crown was a surprise, considering how random they are in the Mid-Atlantic region. I don’t believe I’ve ever seen one in Potter County before. Still, the presence of one Zonotrichia sparrow usually signals others; wouldn’t you know it, soon enough a flock of White-throated Sparrows, much more common birds for the area, emerged from the undergrowth. Warblers weren’t much to speak of, maybe a Yellow-rumped here and a Black-throated Green there. Flycatchers were equally unimpressive, represented by a lone lemon-bellied juvenile Eastern Phoebe hawking its little heart out. We had Downy, Hairy, and Pileated Woodpeckers and large troops of Wild Turkeys, some of which even took flight before us. As I said, the species still around were mostly the expected ones, which made the unexpected ones that much sweeter. One very welcome sighting was a brief glimpse of a roused Ruffed Grouse, suitable only to establish that the jinx of my erstwhile jinx bird is well and truly broken. The last novel sighting was in the raptor category. The skies over Potter County resemble those above any U.S. interstate in that Turkey Vultures and Red-tailed Hawks turn up with astonishing regularity. This fall, it seems that Will’s house has attracted a Northern Harrier; we watched one work a fallow field in the corner of his property for the better part of a day. Hopefully, this bird will deign to stay. We also enjoyed the sight of Common Ravens wheeling high overhead. At 1000 feet, these tricksters seem more raptor than corvid, soaring on thermals with predatory grace. Such a wonderful trip and only wish I could have made it out your direction to see some of those great birds you had! The Upland would have been a lifer for me! I would have liked to have met too, Mon@rch. That Upland was only my second sighting ever. Knowing they’re in the area will make it easier to find them when you do come out. Might I suggest a visit to Potter County in summer. The breeding warblers are thick, and its a good place for the uncommon (for PA at least) Mourning Warbler. Another great spot is The Muck, north of Wellsboro in neighboring Tioga Co. Breeding American and maybe Least Bitterns as well as lots of Virginia Rails, some Sora and possibly even King Rails. There are lots of really nice state parks scattered around that are great if you love camping. Potter County sounds wonderful! I have been to Pennsylvania briefly only once, when I was young (we saw a Pirates game!) but I have read so much positive conservation and birding news from that entire state. I can’t wait to get there again!